Luxury ingredients abound at Crab King in Bellevue’s Crossroads shopping center. Attention, Crossroads shoppers: Have you noticed the new corner restaurant opposite Regal Cinemas where the pizzeria used to be? Perhaps on your way to see “Power Rangers” you scanned the posted menu, gasped at the prices and skedaddled to one of the dozens of other dining alternatives this Bellevue shopping center offers. I don’t blame you, but consider skipping the movie one night and instead put those ticket, popcorn and nacho dollars toward a relaxed evening in Crab King’s art-filled dining room. Granted, you need to be feeling flush. King, snow and Dungeness crab, as well as wagyu beef, are on the menu, luxury ingredients that never come cheap. 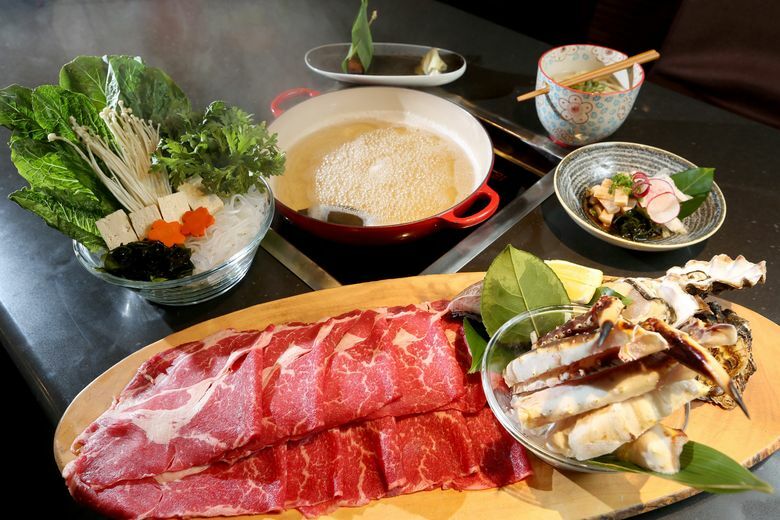 The restaurant’s signature preparation is shabu shabu, a hot-pot style Japanese dish that customers cook at the table, swishing or simmering meat, seafood, vegetables and noodles in a bubbling pot of broth. A couple could have a lot of fun, even get frisky over such tactile, sensuous dining. That’s pretty much what happened for Crab King’s owners, Peipei and Xiaomeng Liu. Xiaomeng is a Chinese restaurateur who acquired Seattle’s Flying Fish four years ago. Peipei, also Chinese, attended school in Japan and worked in restaurants there. They met in Sapporo, where they fell in love with each other and with Kani-Shogun, their favorite of that city’s many crab-themed restaurants. They decided to open something like it here. The original concept revolved around three pricey tasting menus that focused on different crab preparations, but it was slow to catch on. The most popular menu item turned out to be shabu shabu, one of the a la carte entrees. Four months after Crab King opened in December, they revamped the menu to showcase shabu shabu. Business has picked up noticeably since. Shabu shabu may be just the right fit for this suburban neighborhood. It’s fun, healthy and interactive. Families with school-age children filled the restaurant early one Saturday evening. Later on, singles and date-nighters took their places, sipping sake or sweet cocktails tinted blue with Curacao and kicking back in roomy booths or comfortable Zaisu chairs at tables partially secluded by bamboo shades. Everyone was ordering shabu shabu, sharing platters beautifully arrayed with raw ingredients: red, fat-streaked beef, ivory hamachi, half-shell oysters, whole clams and nuggets of king crab in the shell. No matter which meat, fish or combo you choose, you get a bowl of accompaniments: chrysanthemum greens, lettuce, cabbage, seaweed, enoki mushrooms, tofu and cellophane rice noodles. Your waiter will modulate the cooking temperature and replenish the liquid in your Le Creuset braiser as needed. I like to toss in some vegetables first to flavor the mild dashi broth. The fish and thinly sliced meat require only a few-seconds swish in the broth. The crab is frozen, so leave it in a bit longer. Do order bowls of rice. That way when you pluck food out of the broth you can cool it on the rice before dipping into the yin-or-yang sauces: a bracing soy-and-citrus ponzu sauce or an equally bold, creamy sesame emulsion. Save the noodles for the end and slurp them with the last of the broth. Shabu shabu is available a la carte, but the five-course dinner is a good value. The package includes lightly cooked hamachi with a sprightly salad, lovely miso-glazed grilled black cod, udon noodles and dessert. The per-person price depends on your choice of protein. At the high-end there’s A5 grade Miyazaki Wagyu rib-eye ($145); at the low end there’s yellowtail ($52) and USDA prime beef ($56). Alaskan red king crab ($89) falls in-between. Beyond shabu shabu, crab is your best bet among a la carte entrees. King crab legs and snow crab are available two ways: steamed or boiled in a hot pot (nabe) with vegetables and tofu. Both come with udon noodles. The shellfish parts are cracked or sawed in half, allowing easy access to the meat with a clever tool that has a pick on one end and a scraper on the other. Cracking the sautéed salt-and-pepper Dungeness crab requires a little more effort on your part, but it is well worth it. The drawn and quartered crab is packed into the upturned bowl of its carapace. The seasonings mix with tomalley (sometimes called crab liver or butter but technically the hepatopancreas). What you don’t lick off your fingers can be handled by the warm, wet towels and lemon provided. It’s messy and thoroughly satisfying. Sushi and tempura are on the menu, too, but I don’t recommend them. Each comes only as an a la carte entree. The $35 tempura assortment did include some king crab, along with prawns, white fish and various vegetables, but it was very oily. The $34 sushi plate was a mundane lineup of tuna, salmon, yellowtail and eel on cold, clumped rice. For two dollars less, I’d suggest treating yourself to six exquisite pieces of “wagyu sushi.” They are warm, profoundly beefy bites with the melting texture of seared foie gras on much better rice. Put your money there. Then maybe catch a movie.